Isolation of the motor from the air stream and the high velocity vertical (roof) or horizontal (wall) air discharge make the Model STXD ideally suited for the removal of dirty, contaminated and/or high temperature air from processes and buildings. Typical applications include restaurant hoods and similar kitchen exhaust ventilation, fume and smoke removal, laboratory fume hood exhaust and chemical process exhaust. 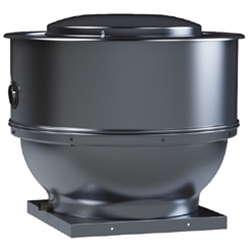 The non-overloading wheel with its higher static pressure capability makes this unit suitable for either ducted or nonducted applications. Its roof or wall mounting permits location near the area to be ventilated, allowing short duct runs and more efficient operation. Direct drive units use smaller diameter wheels, resulting in low sound levels and quiet operation. They have no belts or fan bearings to maintain or adjust and consequently require very little maintenance. Model STXD Motor HP Max BHp. RPM Sones @ 1/8" S.P. CFM at Static Pressure 115V/1 Ph/60 Hz Stock No. 208-230/1 Ph/60 Hz Stock No. 0" 1/8" 1/4" 3/8" 1/2" 5/8" 3/4" 7/8" 1"
Speed (RPM) shown is nominal. Performance is based on actual speed test. Performance certified is for installation type A-free inlet, free outlet. Performance ratings do not include the effects of bird screen in the air stream. The sound ratings shown are the loudness values in the fan sones @ 5' (1.5m) in an hemispherical fee field calculated per AMCA Standard 301. Installation Type A: free inlet hemispherical sone levels. • Heavy-gauge aluminum for extra strength with pre-punched mounting holes. • Stainless steel exterior fasteners. • Enclosed, ventilated motor compartment isolates motor from exhaust air. • Neoprene isolators for reduction of vibration and sound. • The motor compartment housing easily removes for complete maintenance access. • Water-tight conduit tube for easy electrical connection. • Mounted disconnect is included on standard models. • Non-overloading backward inclined for safe operation in ducted systems. • Wheels constructed of noncorrosive aluminum. • Dynamically balanced for smooth operation. • Motors ship mounted as standard.